The Society of Mary (or Marists) had its origins in post-revolutionary France. The fall of Napoleon in 1815 seemed to offer an opportunity for the revival of the Catholic Church after years of suppression. 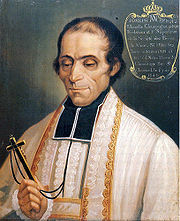 In the diocesan seminary of Lyon, one young seminarian, Jean-Claude Courveille (1787–1866), had an initial inspiration regarding the foundation of a specific congregation to be called the "Society of Mary", but it was Father Jean-Claude Colin, who emerged as the real founder, even though he was the most retiring of the group. On July 23rd 1816, the day following their ordination, twelve young priests went up to the Shrine of Our Lady of Fourvière, overlooking Lyon, and made a promise to Our Lady to establish a society in her name and asked for her special protection. In the parish of Cerdon, where Colin was assigned as assistant to his elder brother Pierre, he began drafting a tentative rule for the group of priests. He also helped Jeanne-Marie Chavoin found the Sisters of the Holy Name of Mary, later called Marist Sisters. 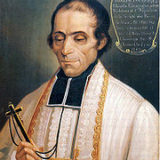 Another member of the same group of former seminarians, the priest Saint Marcellin Champagnat, established the Little Brothers of Mary later known as the Marist Brothers of the Schools. Diocesan reception was cool because the diocese of Lyon was greatly in need of parish priests and afraid of losing them to a new organisation. Little progress was made until Cerdon (Colin’s parish) was moved from the Lyon diocese to the Belley diocese. In 1823, Bishop Devie of Belley authorised Colin and a few companions to resign their parish duties and form into a travelling missionary band for the rural districts. 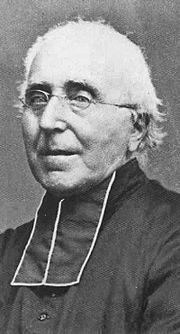 Their zeal and success in that difficult work moved the bishop to entrust them also with the conduct of his minor seminary, thus enlarging the scope of their work. However, little progress could be made toward the foundation of a true religious congregation, since like the Lyons authorities, Bishop Devie wanted at most a diocesan institute only, while Fr. Colin wanted a much wider remit. By the beginning of the 19th century the Vatican was keen to establish the Catholic faith in Africa, Asia and Oceania, The missionary task of the evangelisation of Western Oceania (including Micronesia, Melanesia, Fiji, New Zealand, Samoa, and Tonga) was proposed to the Society of Mary. 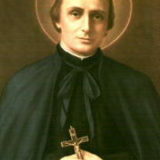 Upon their acceptance Pope Gregory XVI, on April 29, 1836, formally approved the "Priests of the Society of Mary" or Marist Fathers as a religious institute with simple vows and under a Superior General. The Little Brothers of Mary and the Sisters of the Holy Name of Mary, commonly called Marist Brothers and Marist Sisters, were not included but were to become separate institutes. 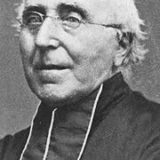 Father Colin was elected Superior General on September 24, 1836, and on that same day the first Marist religious professions took place. 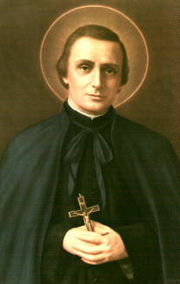 Along with Colin the first professed included two who would become saints: Saint Peter Chanel, S.M., martyred on the island of Futuna in Oceania, and Saint Marcellin Champagnat, S.M., founder of the Marist Brothers. The various missions In Oceania progressed steadily under the Marist Fathers who, besides their religious work, have largely contributed to make known the languages, fauna, and flora of the South Sea Islands. The early missions in Oceania were also supported by a group of ten lay-women from France. Their coordinator was Marie Francoise Perroton and she received approval from Rome to found a further branch of Marists: the Missionary Sisters of the Society of Mary. "I (Mary) was the mainstay of the new-born Church; I shall be again at the end of time"
For Colin this phrase is exemplary for the way Mary lived the Gospel in a humble, modest, and simple way. The Marists are called to imitate Mary in this way of life and ministry. "think as Mary, judge as Mary, feel and act as Mary in all things." Colin called the missionary and pastoral activity of the Marists the "Work of Mary". According to Marist tradition the Society of Mary as a whole and every individual Marist is called to be an "Instrument of Mercy" for all mankind. As Mary was a healing presence in the Early Church so the Marists want to be present in the Church in our times.